Five intensive days in the beautiful context of Casina Settarte immersed in nature among olive, fig, and almond trees, with beaches nearby. We will investigate on the body motion in the natural enviorenment and in the space surrounding it, alternating between indoor and outdoor activities. We will be experiencing moving and dancing following inner impulses, finding pathways inside the body and relating to others with an inner guideline. In Moving there is no right or wrong, just the sensation of connecting to our bodies, sensing and sharing the weight with somebody else, finding new ways of moving and expressing. 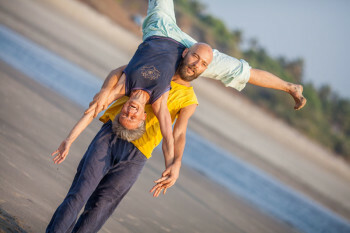 Contact improvisation offers a playful, self-defined way of connecting to other dancers. It becomes a joyful game of give and take. Authentic Movement is a beautiful tool to connect to an inner moving impulse. It is a possibility to express feelings, images and information from the subconscious that come through our bodies. Bodywork teaches us about inner alignment and touch qualities, it is also a wonderful way to let our nervous system integrate our experiences. We make room to process this in sharing. The dance is our teacher.